What is the best way to get your work out there? Through talented & experienced event and party planners. I love every aspect of being involved in shoots, not only is it great for your portfolio but you see a community come together through shoots. The little floral company, the wedding planner, the venue owners, rental companies, calligraphers, photographers -- all come together and create something that is bigger than us, gaining audiences (and followers) by supporting each other. ONLY CALLIGRAPHY & SIGNAGE WAS DONE BY ME. Get your maracas ready, because today I am sharing the details from the Chic Floral Fiesta that I recently hosted with Black Twine, as seen on Martha Stewart! While I don’t necessarily need a reason to entertain, holidays such as Cinco de Mayo provide the perfect excuse to throw a party! 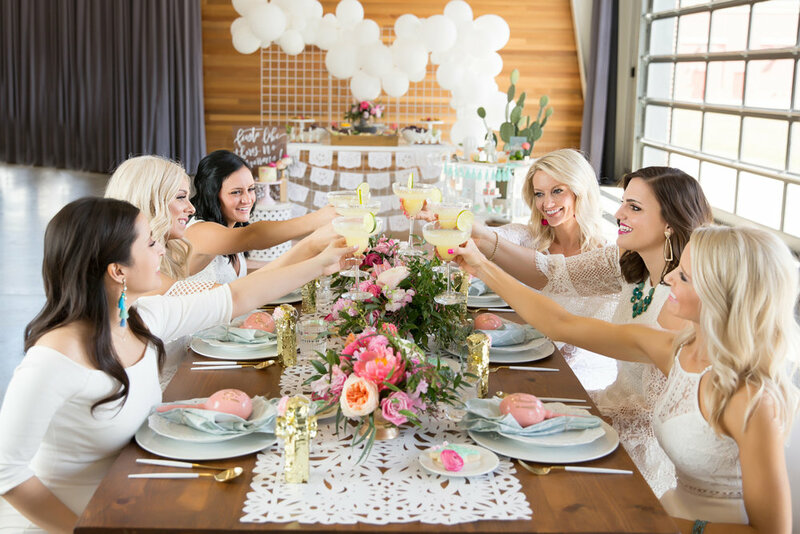 I decided to invite a few of my closest girlfriends together for a fiesta that I hosted in a gorgeous industrial venue with soaring windows and ceilings. 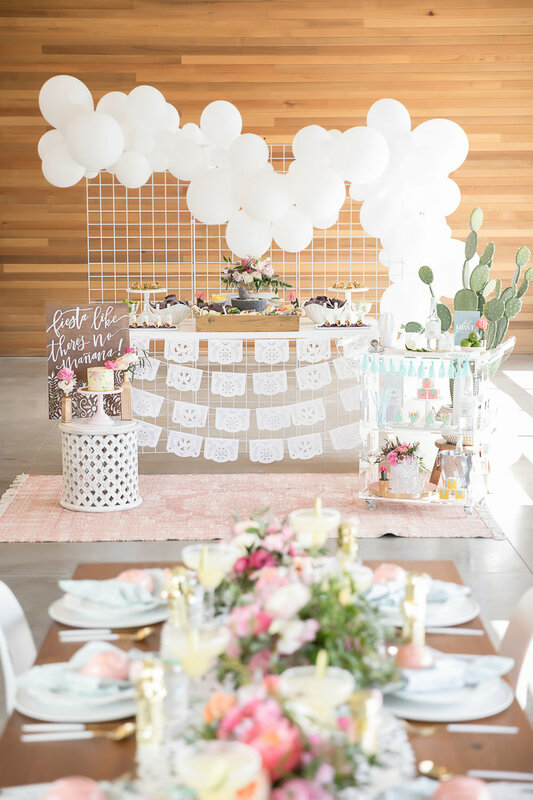 I’ve found that a great way to personalize a popular party theme is to use unexpected colors, so I went with an all-white color pallet with pops of mint green and pink to give the party a modern, feminine Mexican vibe. This idea comes from Tara Berger of One Stylish Party. 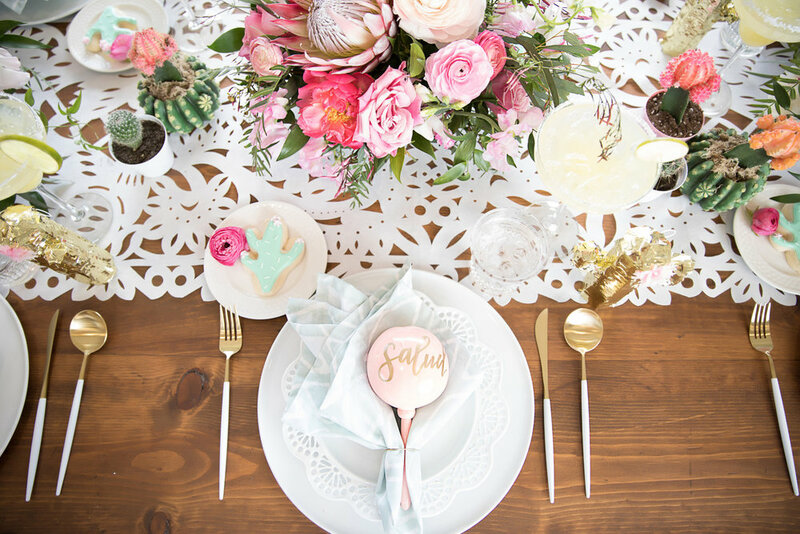 They were featured at her Cinco de Mayo Floral Fiesta in collaboration with Black Twine, calligraphy provided by Seaworthi, and linens provided by Wolf & Irving. "Whenever I am styling a party, I always like to come up with a DIY project to add to the décor," Berger says. "For my Chic Floral Fiesta, I decided to personalize plain maracas with fun fiesta phrases and a gold leaf finish. This project was simple, inexpensive, and helped to tie the party details together." These maracas can be passed out to guests as party favors or, if hand-lettered in their name, a fun take on a place card. If you're setting a formal dining table as part of the celebrations, a bouquet-style napkin fold adds to the presentation.